Found this for three bucks this morning, from 1989 with unmarked pages. What's with kids today, huh? Ooh, don't leave your bedroom window open or "someone" "might" sneak in and steal it! Oh wow, that is pretty cool. Now that I'm taking college classes again I should get a notebook like that. 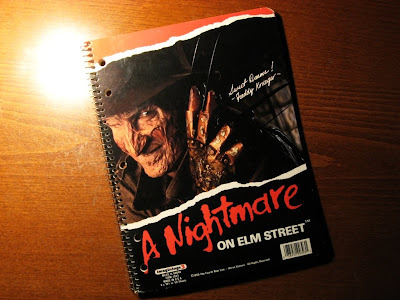 I wish I had a Freddy notebook when I was in grade school. I so wish they had that when I was in school. All i had was the Smurfs. I can still remember literally crying when my uncle surprised with with a giant poster of Freddy when I was 7 or 8. I demanded it taken down from my bedroom wall.